A new launch from Cockwells is always something to get excited about, and the latest 33-footer to come out of the Falmouth boatyard is no exception. ‘Impulsive’ was specifically designed to meet its new owner Stephen Hubbard’s requirements, with an advanced joystick control system, on-board WiFi, and even a Nespresso coffee machine. Detailed leatherwork and handcrafted Cornish chestnut panelling give the vessel that authentic Cockwells look. A Yanmar 6BY3 260hp engine will propel the six-tonne semi-displacement launch up to a top-speed of 18 knots. What’s more, its advanced anchor system is able to hold the craft within 1 metre of any given coordinate. 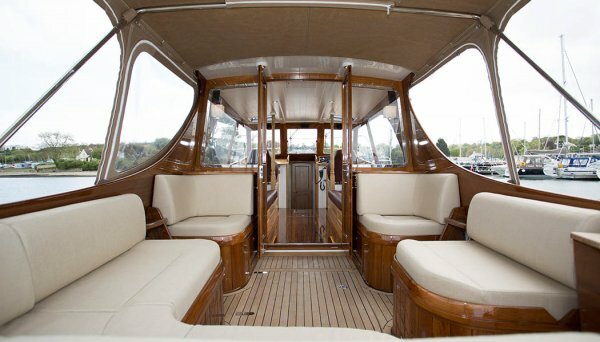 Based around Beauleiu, ‘Impulsive’ cost upwards of £400,000 and will be used as a pure day boat for entertaining. Mr Hubbard was understandably delighted with his new launch, adding: “To be involved with the build process and witness the great craftsmanship, attention to detail and fine design was really enjoyable.